National titles fights can be formalities, especially in countries like Japan where some fighters are genuinely picking up national titles before quickly moving on to bigger and better things. Others are really serious bouts with fighters who both have aspirations of bigger things. One of those bouts that features fighters wanting to move on to bigger things comes this Saturday as we get two world ranked fighters battling not just for the Japanese Light Flyweight title but also for their chance to move up the world rankings and their chance to move towards a world title fight. We had hoped to see a rematch between Kimura and Horikawa but instead we've got an equally as interesting bout with Kimura fighting Yuki Chinen (14-1, 7). Chinen, himself ranked #14 by the WBO, is the bigger man, having several of inches of height advantage over Kimura and is also the the bigger puncher. With a 4" height advantage and stinging power Chinen is dangerous though can be out boxed by fighters who can take his power. Interestingly whilst both men are very different they have only lost to very good fights. Both men have lost to Ryoichi Taguchi, who stopped Kimura in 6 and out pointed Chinen over 10 rounds in a fight for this very same title. 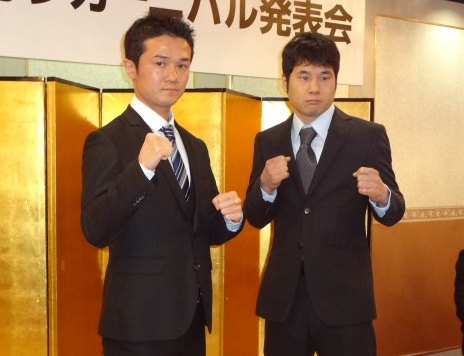 Kimura's other loss came to recent world title challenger Shin Ono in a technical decision way back in 2008. Whilst neither Taguchi or Ono have won world titles neither man has looked out of place when they have fought at world level with Ono giving Takayama Katsunari a tough contest earlier this year whilst Taguchi is the only man to see the final bell against Naoya Inoue. For this actual bout the contest is a hard one to predict. Both men have a lot to win, and a lot to lose. They both have very contrasting styles and sizes and this alone brings a lot of variables. We think Kimura will need to get inside and let his hands go, he'll need to rely on his speed and work rate to have any chance against Chinen and he'll also need to avoid the power of Chinen, especially when you consider that Taguchi stopped him just a bouts back. For Chinen the issue will be opening up just a little bit of distance to help him get the leverage on his shots. He really is freakishly tall for a Light Flyweight and has an astonishing reach for a fighter at 108lbs. He also has some pretty notable wins with victories over Kenta Maeda, in the 2009 Rookie of the Year final, current PABA Minimumweight champion Samartlek Kokietgym and the then Filipino Minimumweight champion Crison Omayao and veteran Ryan Bito. He hasn't stopped any of those men but the wins are still worth noting considering the level of those bouts. It's a tricky one to predict here though with the show being a Teiken show it's fair to assume Chinen knows her maybe needs to do a little bit more than usual to win a fight. With that in mind we expect Chinen to really go for it and try and turn up the heat from the off and we think that might just see him through to a very close decision victory, unless he has to power to stop Kimura. When we talk about great domestic fights this is the sort of thing we think of and whilst neither men are known on the world stage we'd be shocked if the winner of this wasn't moved onto either an OPBF title fight, against Jonathan Taconing, or a world title fight later this year. Funnily if they wish to stay at the Japanese title level they may find their next fight being against Takuma Inoue, who claimed he wanted to be a Japanese national champion in just his third bout.